We do kiddies parties, events management, catering and decor. We offer ‘a party in a box solution’ whereby we provide you with various party themes to choose from i.e. Barbie, Spiderman, Hanna Montana, Cars, Ben 10 etc. 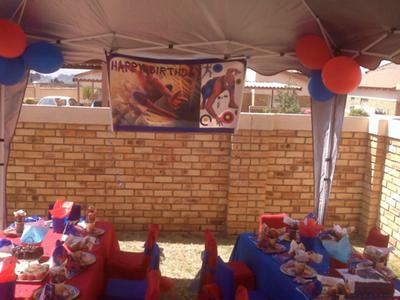 We hire out chairs, chair covers, tables; we organize a themed birthday cake, party packs, jumping castle, a gazebo, food, A clown, face painting etc. No job is too big or small. We cater for all budgets and preferences.